A microtiter plate was coated overnight with various antigens at a concentration of 5 μg/ml. After washing and blocking with PBST + 5% BSA, detection was performed using Human Anti-Golimumab:HRP Antibody, clone AbD25451_hIgG1 (HCA290P) at a concentration of 2 μg/ml in HISPEC Assay Diluent (BUF049A) and QuantaBlu Fluorogenic Peroxidase Substrate. A microtiter plate was coated overnight with golimumab, human TNFα, human IgG1/kappa, human IgG1/lambda or adalimumab at a concentration of 5 μg/ml. After washing and blocking with PBST + 5% BSA, the human TNFα/golimumab complex was formed by adding 2 μg/ml golimumab to the wells coated with human TNFα. 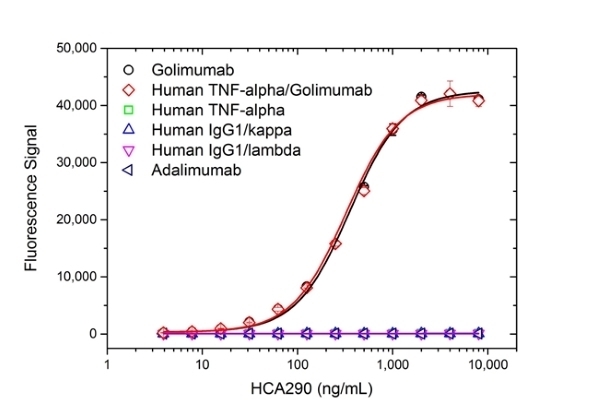 Detection was performed using Human Anti-Golimumab:HRP Antibody, clone AbD25451_hIgG1 (HCA290P) titrated to the given concentrations in HISPEC Assay Diluent (BUF049A) followed by QuantaBlu Fluorogenic Peroxidase Substrate. Data are shown as the mean of three measurements. A microtiter plate was coated overnight with human TNFα at a concentration of 1 μg/ml. 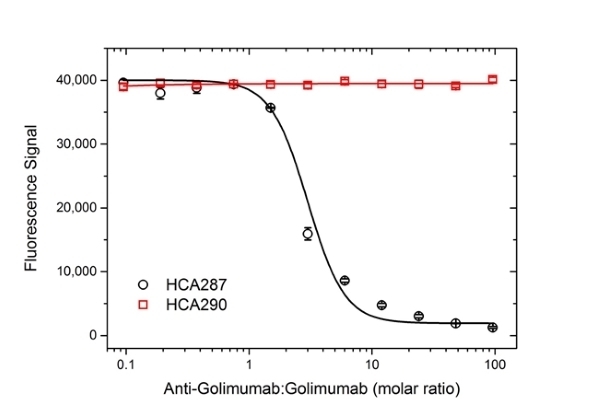 After washing and blocking with PBST+5% BSA, golimumab was added (0.3 μg/ml) spiked with increasing concentrations of Human Anti-Golimumab Antibody clone AbD25418 (HCA287) or AbD25451 (HCA290), both in the monovalent Fab format in this assay. Detection of golimumab was performed using Mouse Anti-Human IgG (Fc) CH2 Domain:HRP Antibody (MCA647P) and QuantaBlu Fluorogenic Peroxidase Substrate. Data are shown as the mean of three measurements. A microtiter plate was coated overnight with Human Anti-Golimumab Antibody, clone AbD25455 (HCA289) at a concentration of 1 μg/ml. After washing and blocking with PBST + 5% BSA, 10% human serum was added spiked with increasing concentrations of golimumab. Detection was performed using Human Anti-Golimumab:HRP Antibody, clone AbD25451_hIgG1 (HCA290P) at a concentration of 2 μg/ml in HISPEC Assay Diluent (BUF049A) and QuantaBlu Fluorogenic Peroxidase Substrate. Data are shown as the mean of three measurements. A microtiter plate was coated overnight with Human Anti-Golimumab Antibody, clone AbD25429 (HCA286) at a concentration of 1 μg/ml. After washing and blocking with PBST + 5% BSA, 10% human serum was added spiked with increasing concentrations of golimumab. Detection was performed using Human Anti-Golimumab:HRP Antibody, clone AbD25451_hIgG1 (HCA290P) at a concentration of 2 μg/ml in HISPEC Assay Diluent (BUF049A) and QuantaBlu Fluorogenic Peroxidase Substrate. Data are shown as the mean of three measurements. Anti-Golimumab Antibody is a recombinant, non-inhibitory, anti-idiotypic antibody in IgG1 format, suitable for bioanalytical assay development for golimumab and biosimilars. It is suitable as the detection antibody in a PK bridging ELISA to measure total drug, paired with HCA289. 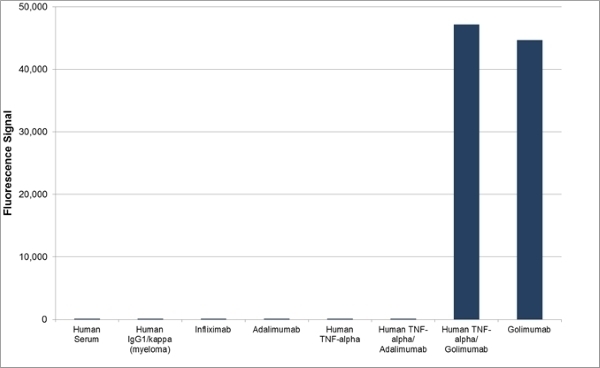 Human Anti-Golimumab Antibody, clone AbD25451_hIgG1 is an anti-idiotypic antibody that specifically recognizes the monoclonal antibody drug golimumab. 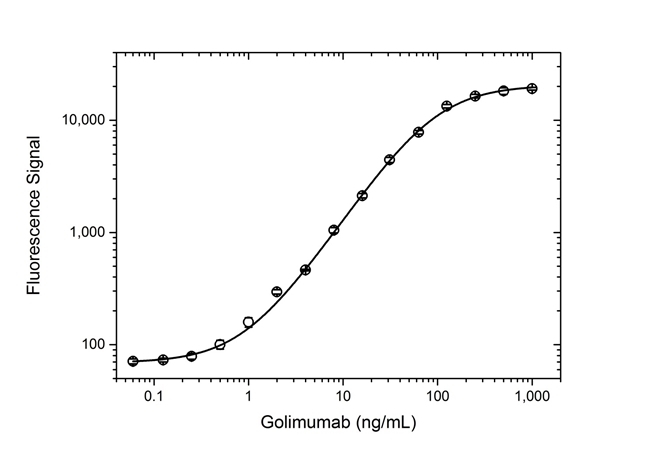 This antibody binds to both free golimumab and to golimumab bound to its target tumor necrosis factor alpha (TNFα). Clone AbD25451_hIgG1 does not inhibit the binding of golimumab to its target TNFα and can be used to measure total golimumab and biosimilar products in bioanalytical assays. Clone AbD25451_hIgG1 is an affinity-matured variant of AbD20897 (HCA242), with about 17-fold affinity improvement. 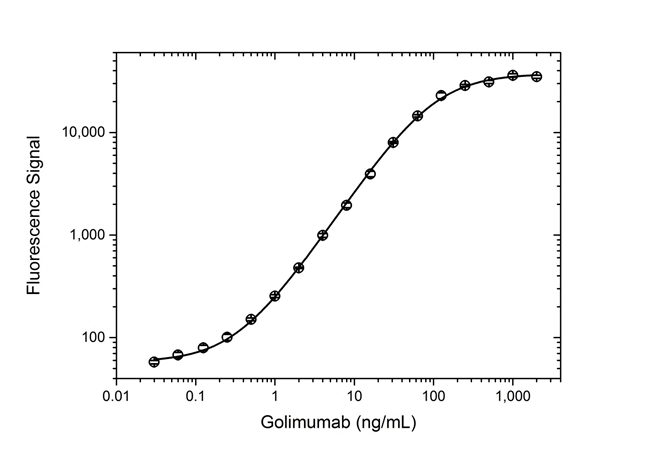 A pair of anti golimumab antibodies can be used to develop a pharmacokinetic (PK) bridging assay to measure total drug. This antibody, in full immunoglobulin format, is recommended as the detection antibody paired with clone AbD25455 (HCA289) as the capture antibody. This product may be used in a direct ELISA or as detection antibody for golimumab in a bridging ELISA together with HCA289 (AbD25455, Fab-FH) as the capture reagent. This product may be used in a direct or indirect ELISA or as detection antibody for golimumab in a bridging ELISA together with HCA289 (AbD25455, Fab-FH) as the capture reagent.